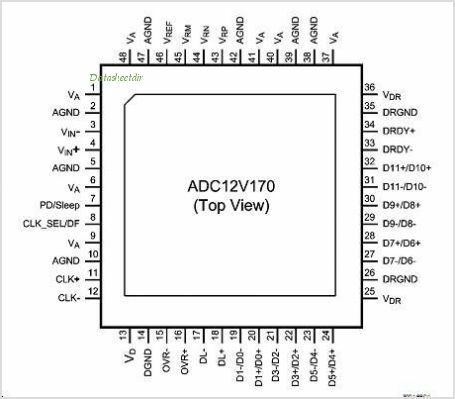 The ADC12V170 is a high-performance CMOS Analog-to-digital converter with LVDs outputs. It is capable of converting Analog input signals into 12-Bit digital words at rates up to 170 Mega Samples Per Second (MSPS). Data leaves the chip in a DDR (Dual Data Rate) format; this allows both edges of the output Clock to be utilized while achieving a smaller package size. This converter uses a differential, pipelined architecture with digital error correction and an on-chip sample-and-hold circuit to minimize power consumption and the external component count, while providing excellent dynamic performance. A unique sample-and-hold stage yields a full-power bandwidth of 1.1 GHz. The ADC12V170 operates from dual +3.3V and +1.8V power supplies and consumes 781 mW of power at 170 MSPS. The separate +1.8V supply for the digital output Interface allows lower power operation with reduced noise. A power-down feature reduces the power consumption to 15 mW while still allowing fast wake-up time to full operation. In addition there is a sleep feature which consumes 50 mW of power and has a faster wake-up time. The differential inputs provide a full scale differential input swing equal to 2 times the reference voltage. A stable 1.0V internal Voltage Reference is provided, or the ADC12V170 CAN be operated with an external reference. Clock mode (differential versus single-ended) and output data format (offset binary versus 2's complement) are pin-selectable. A duty cycle stabilizer maintains performance over a wide range of input Clock duty cycles. The ADC12V170 is pin-compatible with the ADC14V155. It is available in a 48-lead LLP package and operates over the industrial temperature range of 40C to +85C. This is one package pinout of ADC12V170,If you need more pinouts please download ADC12V170's pdf datasheet. 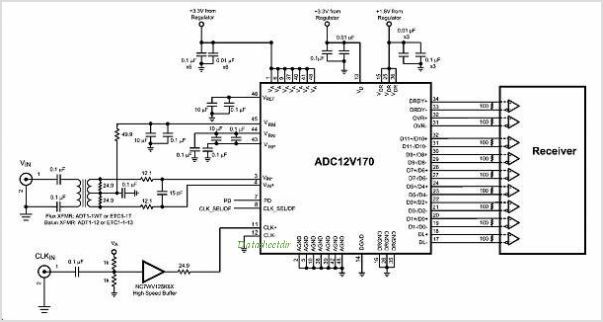 This is one application circuit of ADC12V170,If you need more circuits,please download ADC12V170's pdf datasheet.